Although a beautiful story that is well written, with obvious love for the characters, I found the story line to be a little bit unbelievable at times. It was, however, also moving, funny, charming and often disarming--full of current pop culture references and humor. I took it as how the world should be, but is not, yet The narrators, however, bring these characters to life. Crouch, in particular, has an uncanny ability to inhabit the characters' skins. He speaks as they would speak, intonates as they would, and effortlessly so. He can be hypnotic at times, and make you forget that you are listening to an audio book--but rather feel like you are eavesdropping on someone's innermost thoughts or their private conversations. I just wanted more and more of him. He is a master craftsman and I will make a point of seeking out other works that he has narrated. He's amazing. In 1985, Yale Tishman, the development director for an art gallery in Chicago, is about to pull off an amazing coup, bringing in an extraordinary collection of 1920s paintings as a gift to the gallery. Yet as his career begins to flourish, the carnage of the AIDS epidemic grows around him. One by one, his friends are dying, and after his friend Nico's funeral, the virus circles closer and closer to Yale himself. Soon the only person he has left is Fiona, Nico's little sister. It's been a while since a novel ripped at my seams and left me bleeding by the side of the road quite like this. 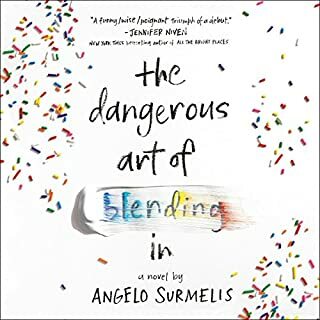 It's not an easy book to sit through, granted, but the characters are so realistically drawn and fully fleshed out that you cannot help but fall in love in them--which is a very, very bad thing when you are forced to say goodbye to them. It hurt. I can't remember the last time a novel left me blubbering like this at the end. Wow. Just, wow. And Michael Crouch is a master storyteller. He inhabits each character so completely that you lose yourself in his voice. The story comes alive under his nimble touch. You forget that you are listening to one man voice a dozen or more characters. He's amazing and never disappoints. Buy this today. Like, immediately. But, be prepared for the emotional roller coaster that's coming! 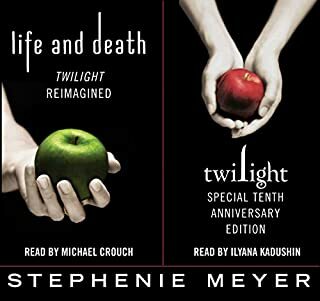 Celebrate the 10th anniversary of Twilight. This special 10th anniversary edition includes the original novel as well as exclusive new bonus content. Listeners will relish experiencing the iconic love story of Bella and Edward again...or for the very first time. Still not 100% sure how I feel about this re-imagining, tbh, but my favorite, trusty narrator, Michael Crouch, is so compelling and engaging and truly gifted at what he does that I found myself sucked in by the 2nd chapter. Dammit. I think there is some difficulty and awkwardness in flipping the genders of the principle protagonists, and I'm not sure if it totally works (although I can appreciate the author's 'girl power' message), but who cares? Mr. Crouch's reading is everything. You'll fall in love with his voice for 51 chapters, as I did. Grad student Will Dillard has largely buried memories of the summer he spent at a camp intended to "cure" homosexuality. But when he finds out a horror movie based on the camp is hitting theaters, he's forced to face his past - and his role in another camper's death. 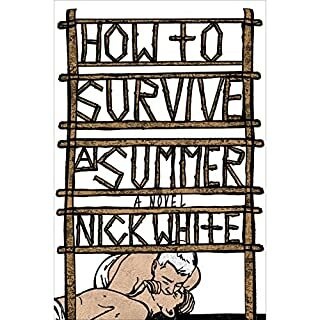 As he recounts the events surrounding his "failed rehabilitation", Will strikes out on an impromptu road trip back home to Mississippi, eventually returning to the abandoned campgrounds to solve the mysteries of that pivotal summer. A sometimes hard-to-listen-to but deeply engrossing story of healing, acceptance and second chances. Will is the survivor of a gay conversion camp that he attended while a young boy in Texas. Because he learns that an exploitation movie is going to be made about his time at the camp, Will goes back to face his demons, in the hopes of putting his past behind him and maybe finding a future for himself. It's a real and honest journey. A note about the narrator, Mr. Crouch. While listening to him, you forget that you are listening to ONE man read these VERY unique and different characters. 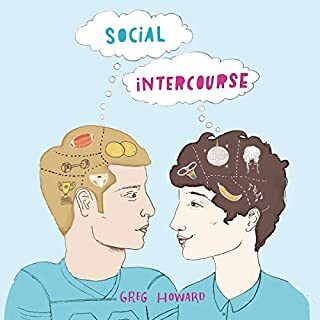 His characters are so distinct, so easily identifiable and relatable...we feel as though we are in the same room, uneasily eavesdropping on conversations and inner monologues. Mr. Crouch puts us in rooms in which we have no business being. He's amazing, engrossing and talented! I'd love for him to narrate my own life story--if only it were interesting enough. Y'all should check out some of his other work, too. Rumor Mora fears two things: hellhounds too strong for him to kill, and failure. Jude Welton has two dreams: for humans to stop killing monsters and for his strange abilities to vanish. But in no reality should a boy raised to love monsters fall for a boy raised to kill them. Nyx Llorca keeps two secrets: the moon speaks to her, and she's in love with her best friend. Braeden Tennant wants two things: to get out from his mother's shadow, and to unlearn his colony's darkest secret. To save everyone they love, they'll both have to commit treason. What an amazing ride this book was! 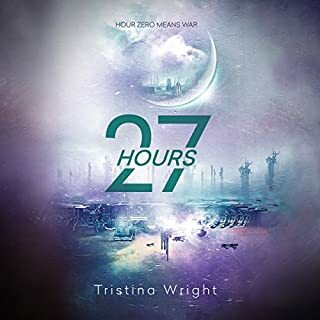 Would you listen to 27 Hours again? Why? 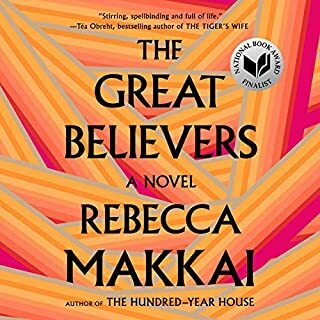 I don't usually listen to an audio book more than once, but this was an amazing story full of humor, love, action and so much diversity and acceptance, so I just might! Rumor and Jude, the perfect couple. Couldn't choose between them--so strong, and passionate and dedicated to doing the right thing. What about Michael Crouch’s performance did you like? Have you ever been listening to an audiobook, say, in your car and then you reach your destination? But, because the story is so gripping and because it is being narrated so expertly, you end up just sitting in your car like an idiot, willing to be late for your meeting, but you are simply unable to tear yourself away? Mr. Crouch does this time and again for me. He positively adds gasoline to this story--he makes the characters come to life and had me on the edge of my seat the entire time, especially as the tension increased toward the final "war." A master at what he does, Mr. Crouch easily conveyed evil, decency, love, regret, passion and, above all, lust! At the very core, this is a complex character study that pours out of an amazing, gripping, exciting book. Wow. I'd listen to Mr. Crouch read a phone book (if those still existed) because he would have an incredibly unique take on every name. Every character's voice hit the mark and helped draw me into the story. He had me as soon as he introduced his name at the top of the book, and kept me entranced until the very last word. I hope this author uses him again for the inevitable sequel. He was fantastic! The final action sequences were so gripping that I was on the edge of my seat. Terrific science fiction. One warm, West Texas November night, a shy boy named Oliver Loving joins his classmates at Bliss County Day School's annual dance, hoping for a glimpse of the object of his unrequited affections, an enigmatic junior named Rebekkah Sterling. But as the music plays, a troubled young man sneaks in through the school's back door. The dire choices this man makes that evening - and the unspoken story he carries - will tear the town of Bliss, Texas, apart. 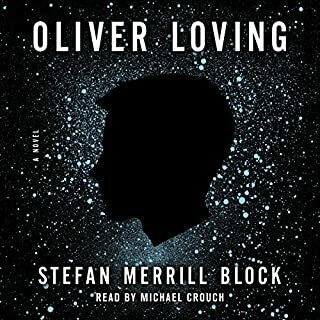 Would you listen to Oliver Loving again? Why? No. It was very well written and intimate and detailed and very, very deep. But, it is heart-wrenching and takes an incredible toll on you, leading up to the jaw-dropping ending. I was emotionally spent. I can't experience that again. No. It needed to be taken in in stages. It's heavy and you need a break every now and then. Yes. But, you have to have an ability to stomach some of the violence experienced by Ev. It can be hard to listen to and will make your blood boil. I was hoping for more time, on the other side of the violence experienced by our protagonist, to luxuriate in a happier ending. But, I still liked it. I loved Ev's quiet/alone scenes in the monastery, and his doughnut scenes with his spineless, helpless, useless dad. Could you see The Dangerous Art of Blending In being made into a movie or a TV series? Who should the stars be? Hmm. I think either Ezra Miller or Timothée Chalamet would make an excellent Ev. And Ben Whishaw as Henry would be great. Michael Crouch's narration was, at times, bone-chilling and really quite scary. He had me on the edge of my seat, especially while voicing the protagonist's Greek mother. I'm going to hear that voice in my head for a long, long time. It scared me. Seventeen-year-old Aidan Lockwood lives in the sleepy farming community of Temperance, Ohio - known for its cattle ranches and not much else. That is, until Jarrod, a friend he hasn't seen in five years, moves back to town and opens Aidan's eyes in startling ways: to Aidan's ability to see the spirit world; to the red-bearded specter of Death; to a family curse that has claimed the lives of the Lockwood men one by one...and to the new feelings he has developed for Jarrod. Can't find enough good adjectives. 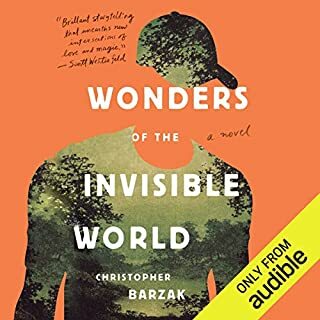 Would you be willing to try another book from Christopher Barzak? Why or why not? Sure! He's really talented and original. Our protagonist, Aidan Lockwood, visiting the supernatural town to find answers to his "gifts." What tipped this book over the top for me was the great, moody and committed narration from Michael Crouch. That man can read anything and make it interesting. He's really that good. Archer Magill has spent a lively five years of grade school with one eye out in search of grown-up role models. Three of the best are his grandpa, the great architect; his dad, the great vintage car customizer; and his uncle Paul, who is just plain great. These are the three he wants to be. Along the way he finds a fourth - Mr. McLeod, a teacher. In fact the first male teacher in the history of the school. But now here comes middle school and puberty. Change. Archer wonders how much change has to happen before his voice does. 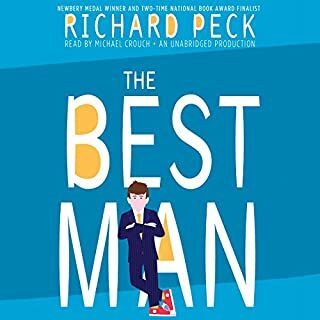 What did you love best about The Best Man? It was good ole homespun fabulousness and a great story. Very funny and a truly moving ending thathad me wiping away a tear. Archer Magill. With a name like that, he was born to be a star! And he is. Mr. Crouch truly embodies the characters he voices--in this case, a (younger) teenage boy--with such aplomb and conviction that you cannot help but be charmed by him and his performance. I've listened to a lot of his books and this is one of his finest. I laughed and cried, not just because of the source material, but because of his performance. Idols Come In All Forms, Many Unexpected. Can we just admit to ourselves that Michael Crouch should be narrating all of our lives? Jaysus, can Michael Crouch narrate my daily life? 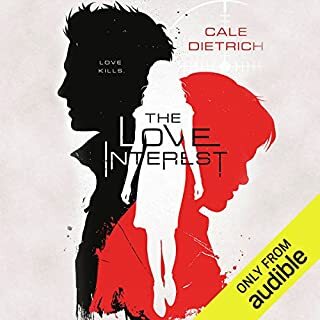 Where does The Love Interest rank among all the audiobooks you’ve listened to so far? I love an usual story that is inventive, innovative and well-written. This book certainly is that. What was one of the most memorable moments of The Love Interest? What does Michael Crouch bring to the story that you wouldn’t experience if you just read the book? The epilogue was particularly satisfying. I had been tense the last few chapters. It was a very satisfying denouement. How can I hire Michael Crouch to read me to sleep at night. Seriously.